In the heat of the Black Power Movement in the early 1970s, the Last Poets would be the defining voice for a genre that would come to dominate the music market for decades to come. The Poets, whose a cappella chants were derived from "jail toasts," the language of black prison inmates, laid down what would later would be recognized as the first rap music. Their art form was extremely revolutionary for the time; advertising for their first (Douglas Records) album, "Wake Up Niggers!" was rejected by---of all people--- Bill Graham --- when it was submitted for placement in the program booklets of the Fillmore East and West. 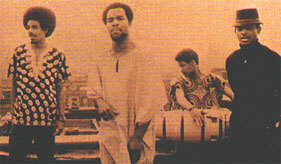 The Last Poets track, "Niggers Are Scared of Revolution" was, however, included in the milestone Mick Jagger film, "Performance." Public Enemy recently reinterpreted the Poets' "White Man's Got A God Complex". The Last Poets are the seminal street poets, whose respect has only grown as their genre's time has come.